Winter seems to becoming the season of storms as well as snow and low temperatures. After a storm, there is always a big clean up process that all property owners face, and an experienced tree surgeon can advise you on whether trees can be saved or should be removed. Some trees will require a simple reduction to decrease the sail area of the crown in order to reduce the stress on the tree and especially the root ball. Others may need to be staked and supported, while others will unfortunately need to be removed. A professional tree service will make every effort to save as many trees as possible. They know that your safety and your family’s safety is first priority. If we believe that any kind of damage has occurred which could potentially threaten your family or your property, we will do an assessment and work with you to solve the problem. 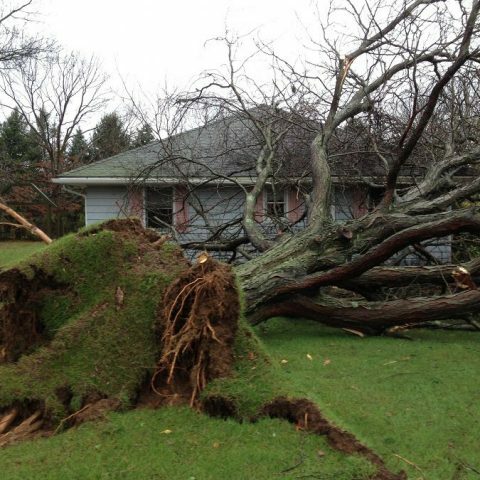 For example, if a tree has come down on a power line, that could be a serious risk for you and your family. In such a case it is obvious that the tree must be removed as soon as possible. Such a delicate operation will require the services of tree removal professionals who will have the proper experience, equipment and carry proper liability insurance. In order to perform an inspection of your trees and shrubs, please contact Toby to arrange an appointment at your convenience.